Samsung and Giorgio Armani have combined powers once again to bring us a fashion Galaxy S phone. 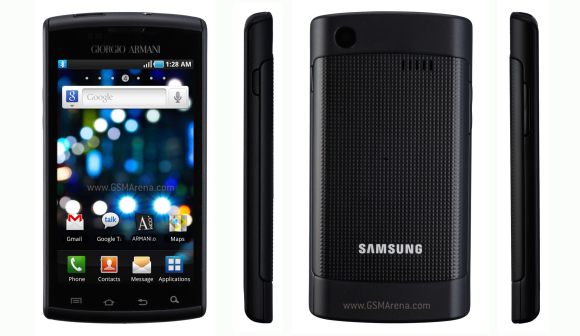 Samsung I9010 Galaxy S Giorgio Armani is in fact a rebranded Captivate with Armani logos, wallpapers and apps. The Samsung Captivate is the Galaxy S smartphone exclusive for AT&T US. The new Giorgio Armani Galaxy S phone is identical to the Captivate - a 4-inch Super AMOLED screen, a 1GHz processor, 16GB internal storage, 5 megapixel camera with HD recording and lots of connectivity options. The fashion gadget will hit the Giorgio Armani boutiques and some major retailers in Italy, France, the UK, Germany, Dubai, China, Hong Kong, Spain, Russia and the Netherlands starting from next month with a hefty 700 euro price. Ha! i love how this video was filmed on an iphone!